Make the Finals Guide & Review - Casino Answers! The first round is listed in groups. Here, you must bet on which team(s) will advance to the Quarter Final round. You can bet on as many teams in whichever groups you like. To place your bets, use the “+” button to the right of “Stake.” Available wagers are $0.05, $1, $2, $5, $10, $15, $20, $25, $30, $40, $50, $100 and $200. You can also make bets in advance (ie. bet on a team to win the tournament in the first round) for juicer odds. Once you are satisfied with your bets, use the “Submit Bets” button to play. If you want to see how a team has done thus far in the game, hit the “Results” button in the top-left corner of the game and select a team. You will see their standings in their first round group, how they did in the Quarters, etc. The team’s performance may factor into what wagers you make, so you might want to look at this while making your Quarter Final bets. To play the Make The Finals specialty game, get a $1400 signup bonus when you sign up today at 888 Casino! Are USA players able to play Make The Finals for real money? Soccer fans based in the United States cannot play Make The Finals for real money. For a US-friendly casino with a soccer-themed specialty game, please read our Soccer Shot Pachinko Review. 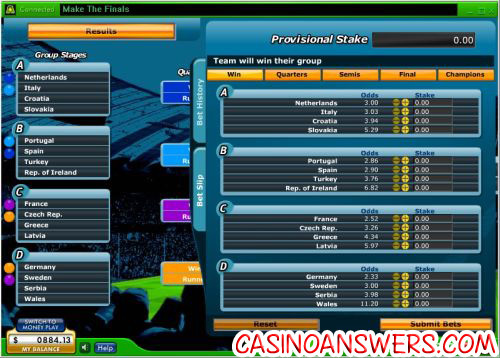 What teams can I find in the Make The Finals casino game? Every European nation is in the game. 16 teams will randomly be put into four groups for each game. Unfortunately, there is no way to shuffle or reset the teams, so you’ll have to go through and play a game without betting if you want new teams to choose from. 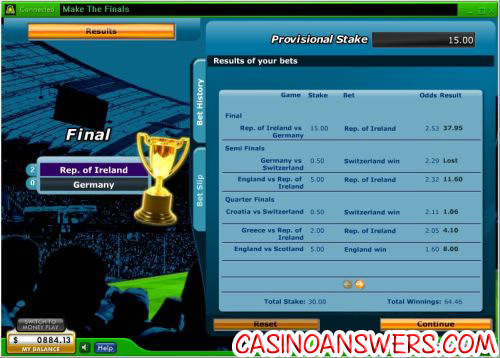 World Cup Fantasy Bet Prediction Casino Game?